— John Wanamaker, founder of one of the first department stores in the U.S. But measuring communication success beyond clicks and page views is hard, and almost nobody does it well. Enter Sinickas, the Diva of Diagnostics. She’s been measuring communication success for more years than your social media director has been alive. She’s trained communicators in more countries than I have on my bucket list. She’s earned more Gold Quills than Kim Kardashian has pairs of shoes. 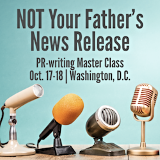 And on Oct. 11-12, she’ll be teaching Become an ROI Rock Star With the Diva of Diagnostics in Washington, D.C. This is a rare chance to have Angela look over your shoulder and give feedback on your measurement plan. We expect tickets to this event to sell out fast. If you’d like to be one of 50 lucky communicators to learn to measure your communications like Angela Sinickas does, please register now.